On January 22, 2019, deputies and detectives at the Hesperia Sheriff’s Station received information, Pedro Martinez had molested a six-year-old male victim at the Maple Elementary School in Hesperia. Through their investigation, they located additional victims, who corroborated the first victim’s disclosure. Detectives from Sheriff’s Specialized Investigations Division, Crimes Against Children Detail joined the investigation. 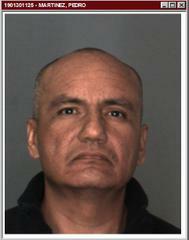 Martinez was arrested and booked at Central Detention Center in San Bernardino. Martinez has been a janitor at the Maple Elementary School in Hesperia since 2005. Detectives believe there may be additional victims and are releasing Martinez’s booking photo. Anyone with information is asked to call detectives at the Hesperia Sheriff’s Station or at Sheriff’s Specialized Investigations Division, Crimes Against Children Detail. Callers wishing to remain anonymous are urged to call the We-Tip Hotline at 1-800-78-CRIME (27463).